The second annual Hey Hey 5k returns to Baileys Harbor Autumnfest Sept. 23, 2017. The Hey Hey 5k will start and end at the Door County Brewing Co. taproom at 8 am, and all runners get some great swag once again! Each participant will receive a special Door County Brewing Co. Hey Hey 5k mason jar pint glass, as well as a Hey Hey 5k shirt. Oh, and that pint glass includes a first fill free at the taproom! (We suggest the Pastoral, an amazing Farmhouse Ale, but you can’t go wrong!). 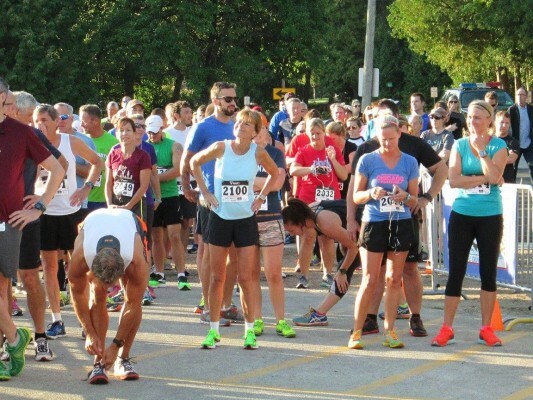 The Hey Hey 5k, presented by the Door County Brewing Co, celebrates an iconic Door County character with a run through the back roads of Baileys Harbor. The race is sponsored by FM 106.9 The Lodge and is brought to you by the Peninsula Pacers, creators of the Door County Half Marathon, Door County Beer Festival, and Peninsula Century bicycle rides. The run is named for one of the favorite sayings of a man who wasn’t much for running, but was all about fun, Baileys Harbor icon Freddie Kodanko. The late Polka King also inspired the name of one of Door County Brewing Co.’s signature beers, the Polka King Porter. Freddie K never ran a day in his life, but he loved a good time, loved his polka, and exuded the Door County spirit of friendliness and fun. On-site registration will be available Saturday morning at 7 am, and runners will also be able to register at the taproom Friday night, Sept. 23, from 6 – 9 pm. To guarantee your shirt size, you must register by noon, Tuesday, Sept. 20. After the race, check out the food, classic auto and motorcycle show, live music and more activities going on at Baileys Harbor’s Autumnfest celebration just a short walk from the finish line!